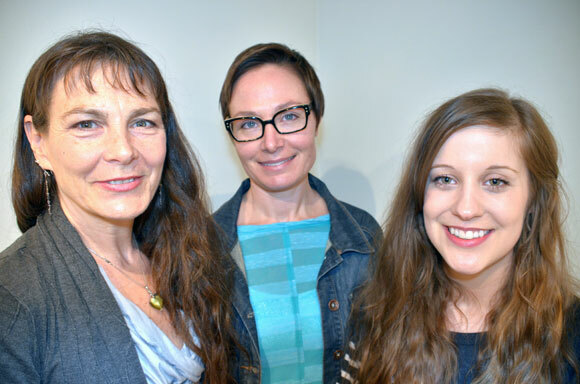 Okanagan Short Story Contest winner Shelley Wood (Leave-taking) centre; is flanked by second-place winner Glenna Turnbull (things you find on the side of the road) left; and Brittni Mackenzie-Dale (Dead Man’s Bluff) right. A story that weaves in and out of the lives of three people over many years has won Shelley Wood of Kelowna first prize in the Okanagan Short Story Contest for her original piece of writing, Leave-taking. There is a woman, quietly reading the list of benefactors posted on a hospital wall; another much younger woman, frustrated in her search for food in a refrigerator, finding little but Tupperware containers that cannot be trusted; and a man, eyes shut and lying in bed, catching a scent he once loved. Wood’s submission topped 121 entries in the Okanagan Short Story contest, sponsored by UBC’s Faculty of Creative and Critical Studies, the Kelowna Capital News and the Central Okanagan Foundation. Entries were judged by UBC Writer in Residence Gerry Shikatani, and creative writing faculty members. Shikatani praises Wood’s Leave-taking, about three lives intersecting, dividing and converging to form the basis of a very finely constructed story. The winning $500 cash prize includes a one-week residency at the Woodhaven Eco Culture Centre. Woodhaven’s rustic setting of whispering pines, trails and meandering wildlife offers an inspiring atmosphere for artists and writers to relax, work without distraction, and discuss their projects. The $200 second prize goes to Glenna Turnbull, of Kelowna, for things you find on the side of the road. Shikatani calls Turnbull’s story a conceptually interesting narrative that takes readers on the road to find the pieces of a young woman’s life. Third place and a $100 prize goes to Brittni Mackenzie-Dale, of Kelowna, for Dead Man’s Bluff. In this story, a group of boys head out one October day to play Blind Man’s Bluff. But their self-appointed leader Justin, has put a twist to the game he has re-named. Where this fun takes them will affect them for the rest of their lives. “This is a story cut from the familiar and rewarding plot-line of popular novels and movies, given another engrossing take,” said Shikatani. The winners were announced at UBC’s final Visiting Authors event of the season at the Alternator Gallery for Contemporary Art. Kelowna writer Alix Hawley, who teaches literature at Okanagan College, read a new short story to an appreciative audience. Wood, Turnbull and Mackenzie-Dale are all former creative writing students at UBC.